You may also access the Data Center storage space with Android devices. 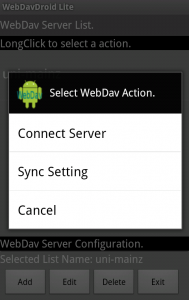 We have tested this with WebDavDroid Lite (available for free in the market). But the precedure described here should work in the same way for other apps. To establish a connection to the home directory of your university account you have to configure a new server. Here, this is done via the Add button. 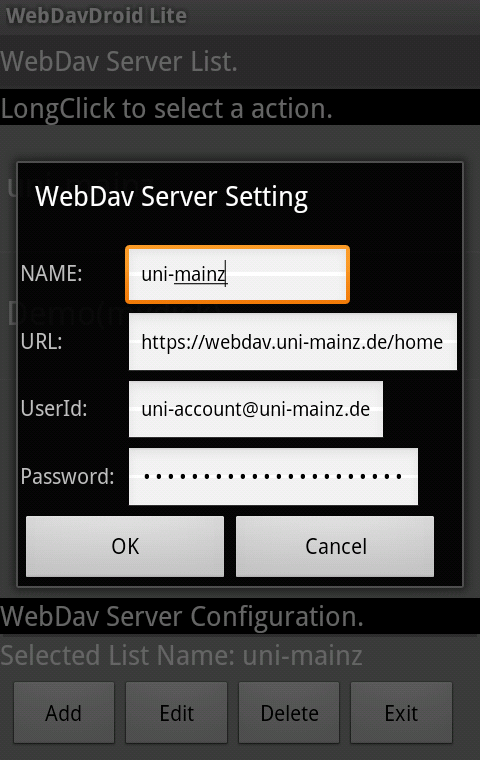 Name: the name of the connection used by the Webdav app. All you have to do is recognize it as what it is. You might name it 'uni-home' or 'webdav uni' or something similar. Passwort: your password for your university account. On mobiles devices we would recommend not to save the password on the device - if you do not enter your password here you will be asked for the password whenever you are establshing the connection. Although that is more arduous it could save you a lot of trouble in case your device gets lost or stolen. 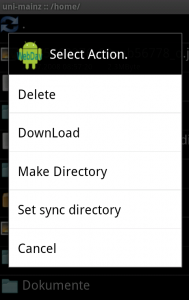 Local Folder, if you want to send files from your Android device to your university home directory. Server Folder, if you want to download files from your university home directory. Changing between local and remote directory (i.e. between your Android device and the university home directory) is done be touching the menu button - here you may choose the respective other folder.